Cheer up, non-Bonnaroo-ers. Your friends at the ‘Roo might just be missing the best weekend for fun stuff in Nashville ever. There’s plenty of things to do right here at home, and you get an unfair advantage at CMApocalypse Bingo. Don’t you feel better already? Blitzen Trapper in-store. Grimey’s, 5:30pm, free. Stopping through on their way out of town (they played at Bonnaroo yesterday) for those of us not lucky enough to be out at the farm, you can catch Blitzen Trapper for free at Grimey’s this evening. It’s an early one! CMA Fest at Riverfront Park. Riverfront Park, all day, free. Even the most jaded locals can’t hate on CMApocalypse for bringing free entertainment to our downtown streets (we can, however, hate on the lack of parking). You can catch Rodney Adkins and Craig Morgan for free tonight, or glance through the lineup for Saturday and Sunday to find something that strikes your fancy. Movies in Pinkerton Park. Franklin, TN, 8pm, free. We’re not the only ones lucky enough to have Movies in the Park this summer. Our neighbors to the south have their own Movies in the Park, and it starts tonight with one for the kiddos – Cloudy With A Chance of Meatballs. Free Shred Day. Knowles Fifty­Forward, 174 Rains Avenue Nashville, TN 37203, 10am-1pm, free. Got a lot of junk mail or sensitive documents to shred, but can’t find the time (or the patience) to remove all the staples and hand-feed three sheets at a time to your home shredder? Hit up Shred On The Run with up to five boxes or bags of stuff to be shredded, and they’ll shred it for free this Saturday! Free Fishing Day. Statewide, Saturday is the one day a year you can fish without a license. Unless you’re a kid – Then, you can fish from the 12th through the 18th without a license! Check out the list of free fishing events here, and head out to the garage to unearth that old fishing pole and tackle box. Nashville Rollergirls host Honky Tonk Stomp. Tennessee State Fairgrounds, 4pm-9:30pm, $13. Come cheer on our Rollergirls as they host the Tennessee State Championship in their last weekend at the state fairgrounds. You can read all about it, plus an entertaining account of a first-timer’s visit to a Rollergirls practice, here at Nashvillest. For tickets, click here. Big Band Dance with J. Bradley Big Band. Centennial Park bandshelter, 7-10pm, free. Dance the cha cha at this week’s Big Band Dance with the J. Bradley Big Band. Don’t know how to dance the cha cha? That’s the point! Take a free dance lesson from 7-7:30, then spend the rest of the evening practicing your newly-acquired dance moves. It’s free, it’s fun, and it’s good for some laughs. Andy Davis, Trent Dabbs & Andrew Belle. 3rd & Lindsley, 8pm, $12. CMApocalypse hasn’t silenced all of the non-country local music that Nashville has to offer. Some of our favorite Ten out of Tenn artists are playing at 3rd & Lindsley this weekend, so if you need a breather from the blaring honky tonks, head a few blocks south to recharge. 2nd Saturday Outdoor Cinema: Raising Arizona. Belcourt Theatre, 8pm, free. 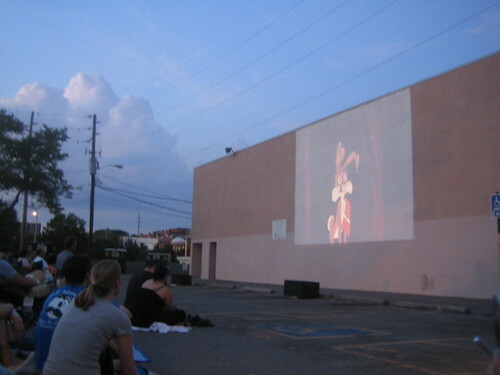 The Belcourt’s annual outdoor summer movie series kicks off this weekend with Raising Arizona. It’s in the parking lot, and it gets really crowded, so we recommend bringing a small folding chair or a very padded blanket to save your rear from the asphalt. 25th Annual Purity Miss Martha’s Ice Cream Crankin‘. First Presbyterian Church (Franklin Road), 3-6pm, $13 at the gate. We already sung Miss Martha’s praises, but we’ll sing ‘em again and again, although 500 gallons of homemade ice cream should speak for itself. Landon Pigg, Madi Diaz & Terra Naomi. 3rd & Lindsley, 7pm, $10. Even more great local music of the non-country variety at 3rd & Lindsley this weekend. Nashville Symphony Regions Community Concert. Crockett Park (Brentwood), 7pm, free. The Symphony will be in Brentwood on Sunday night for the second of a series of 8 free outdoor concerts this month. And yeah, we already wrote about this too. So go!